Regulation (EC) No 882/2004 lays down general rules for the performance of official controls to verify compliance with rules aiming, in particular, at preventing, eliminating or reducing to acceptable levels risks to humans and animals either directly or through the environment. Regulation (EC) No 178/2002 of the European Parliament and of the Council of 28 January 2002 laying down the general principles and requirements of food law, establishing the European Food Safety Authority and laying down procedures in matters of food safety ( 2 ), lays down the general principles governing food and feed in general, and food and feed safety in particular, at Union and national level. That Regulation provides that food and feed imported into the Union for placing on the market within the Union is to comply with the relevant requirements of food law or conditions recognised by the Union to be at least equivalent thereto. Regulation (EC) No 852/2004 of the European Parliament and of the Council of 29 April 2004 on the hygiene of foodstuffs ( 3 ) lays down general rules for food business operators on the hygiene of foodstuffs. That Regulation provides that food business operators are to ensure that all stages of production, processing and distribution of food under their control satisfy the relevant hygiene requirements laid down therein. In particular, Regulation (EC) No 852/2004 provides that food business operators carrying out primary production and those associated operations listed in Annex I thereto are to comply with the general hygiene provisions laid down in Part A of that Annex. Following the outbreak of Shiga toxin-producing E. coli (STEC) in May 2011 in the Union, the consumption of sprouted seeds was identified as the most likely origin of the outbreaks. On 20 October 2011, the European Food Safety Authority (‘EFSA’) adopted a Scientific Opinion on the risk posed by Shiga toxin-producing Escherichia coli (STEC) and other pathogenic bacteria in seeds and sprouted seeds ( 4 ). In its Opinion, EFSA concludes that the contamination of dry seeds with bacterial pathogens is the most likely initial source of the sprout-associated outbreaks. In addition, the Opinion states that, due to the high humidity and the favourable temperature during sprouting, bacterial pathogens present on dry seeds can multiply during sprouting and result in a public health risk. In order to ensure the protection of public health in the Union and in view of that EFSA Opinion, Commission Implementing Regulation (EU) No 208/2013 ( 5 ) was adopted. That implementing Regulation lays down rules on the traceability of consignments of sprouts and of seeds intended for the production of sprouts. In order to ensure an adequate level of protection of public health, it is appropriate that sprouts and seeds intended for the production of sprouts imported into the Union also comply with the requirements laid down in Regulation (EC) No 852/2004, and, for sprouts, with the traceability requirements laid down in Implementing Regulation (EU) No 208/2013 and with the microbiological criteria laid down in Commission Regulation (EC) No 2073/2005 ( 6 ). Appropriate certification requirements should therefore be laid down for such commodities imported into the Union. Currently Union legislation does not provide for certificates for the import into the Union of sprouts and of seeds intended for the production of sprouts. It is therefore appropriate to set out in this Regulation a model certificate for the import of such commodities into the Union. 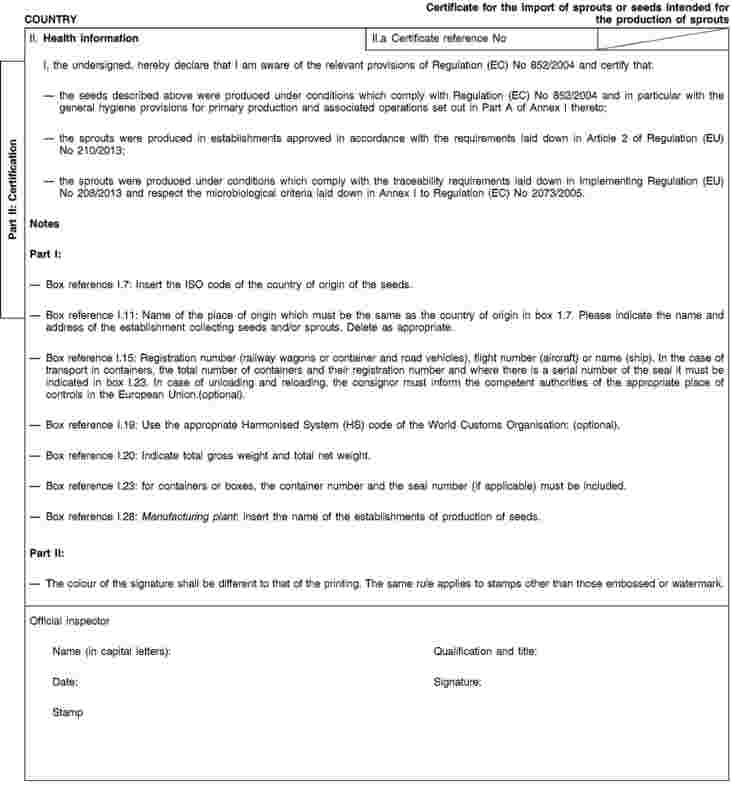 This Regulation shall apply to consignments of sprouts or seeds intended for the production of sprouts imported into the Union excluding sprouts which have undergone a treatment which eliminates microbiological hazards compatible with European Union legislation. (iii) conveyed by the same means of transport. 1. Consignments of sprouts or seeds intended for the production of sprouts imported into the Union and originating in or dispatched from third countries shall be accompanied by a certificate in accordance with the model set out in the Annex, attesting that the sprouts or seeds were produced under conditions which comply with the general hygiene provisions for primary production and associated operations set out in Part A of Annex I to Regulation (EC) No 852/2004 and the sprouts were produced under conditions which comply with the traceability requirements laid down in Implementing Regulation (EU) No 208/2013 ( 7 ), have been produced in establishments approved in accordance with the requirements laid down in Article 2 of Commission Regulation (EU) No 210/2013 ( 8 ) and respect the microbiological criteria laid down in Annex I to Regulation (EC) No 2073/2005. The certificate and, when applicable, the results of microbiological testing on Enterobacteriaceae as referred to in paragraph 4 of this article, must be drawn up in the official language or languages of the third country of dispatch and the Member State in which the import into the EU takes place, or be accompanied by a certified translation into that language or languages. If the Member State of destination so requests, certificates must also be accompanied by a certified translation into the official language or languages of that Member State. However, a Member State may consent to the use of an official Union language other than its own. 2. The original of the certificate shall accompany the consignment until it reaches its destination as indicated in the certificate. 3. In the case of splitting of the consignment, a copy of the certificate shall accompany each part of the consignment. 4. 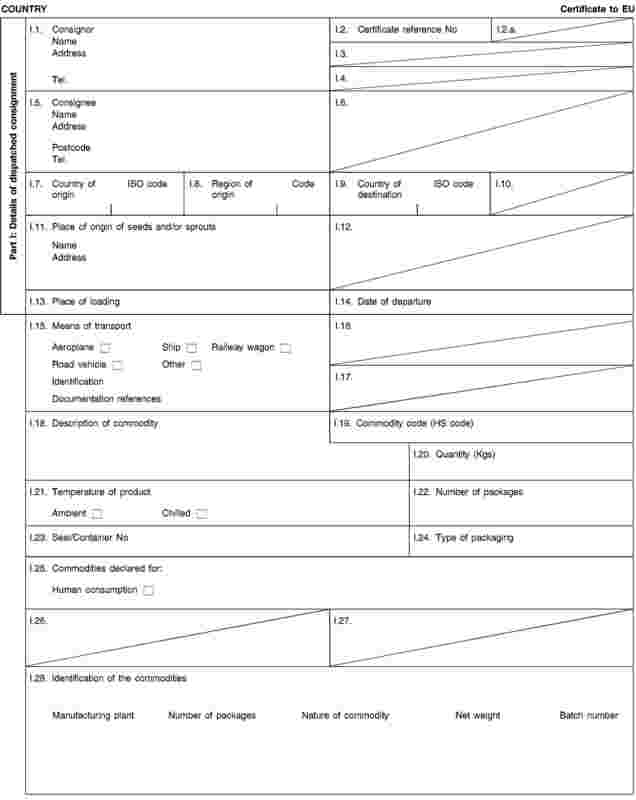 However, by way of derogation from the requirement in paragraph 1 to officially attest that the seeds were produced in compliance with the provisions of Regulation (EC) No 852/2004, and until 1 July 2015, consignments of seeds for sprouting destined to be exported to the Union may be subjected to a microbiological test on Enterobacteriaceae to verify the hygienic conditions of production prior to exportation. The results of those microbiological tests may not exceed 1 000 cfu/g. 5. The certificate and the results of such tests, if applicable, must be made available by the Food Business Operators producing sprouts using imported seeds, on demand of the competent authorities. ( 1 ) OJ L 165, 30.4.2004, p. 1. ( 2 ) OJ L 31, 1.2.2002, p. 1. ( 3 ) OJ L 139, 30.4.2004, p. 1. ( 4 ) EFSA Journal 2011; 9(11):2424. ( 5 ) See page 16 of this Official Journal. ( 6 ) OJ L 338, 22.12.2005, p. 1. ( 7 ) Commission Implementing Regulation (EU) No 208/2013 of 11 March 2013 on traceability requirements for sprouts and seeds intended for the production of sprouts (OJ L 68, 12.3.2013, p. 16). ( 8 ) Commission Regulation (EU) No 210/2013 of 11 March 2013 on the approval of establishments producing sprouts pursuant to Regulation (EC) No 852/2004 of the European Parliament and of the Council (OJ L 68, 12.3.2013, p. 24).